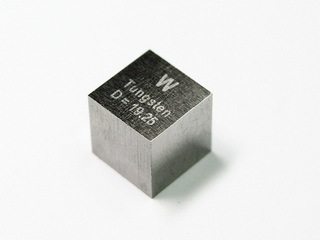 Tungsten was isolated in 1783 by J.J. and F. Ehuijar in Vergara, Sweden. Tungsten metal is lustrous and silvery white in color, and does not occur naturally (it has an abundance of 1 ppm in the earth's crust). It is found in the ore Wolframite, a tungstate of iron and manganese, (FeMn)WO4, which is converted to the trioxide and then reduced to the metal by reduction in hydrogen (carbon cannot be used as the very stable carbide would result). Tungsten metal is relatively inert, resisting attack by oxygen, acids and alkalis, although it will react with fused, oxidising alkali media. It has the highest melting point of all metals and, when pure, it can be worked with relative ease; however, the presence of impurities renders tungsten extremely brittle and, therefore, difficult to fabricate. The high melting point of tungsten makes it suitable for use as electric filaments (e.g. in electric light bulbs). It is also the basis of a range of alloys containing tungsten, copper and nickel which are used for radiation shielding as they provide a 50% increase in density compared to lead. 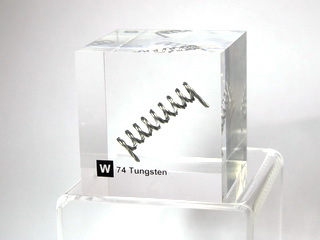 Tungsten and its alloys also find uses in military applications (e.g. armour and shells), as well as counter-balance materials. 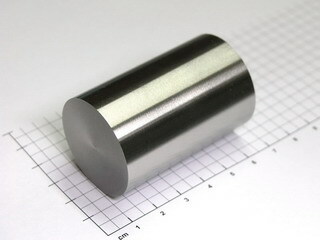 Tungsten carbide powder (with possible additions of titanium and tantalum carbides) along with nickel or cobalt powders, are compressed and sintered to produce cemented carbides. These products are used in place of high speed steel to form the tip of cutting and drilling tools, or for parts which will be subjected to heavy useage. Amount: 1 St./ 1 pc. Nice Tungsten doped glass bead NEW!